St. Louis Screened Porches: A screened room with a view for outdoor living. Ahhh…. a screened porch. The perfect spot for napping, lounging, reading, dining, entertaining… being. A screened in porch equals relaxation… a sheltered outdoor living space perfect for enjoying your backyard with shade, protection from wind, bugs, sun and rain. Add electrical outlets and lighting and your screened porch truly becomes and outdoor ‘room’, day or night. In today’s St. Louis market, screened porches, screen rooms, and screened enclosures — alone or in combination with a deck — add dollar value and attractive curb-appeal as a home addition. And over the years, contemporary screen porch plans have evolved with state-of-the-art designs, building products and accessories. Simple visual and design ‘touches’ make a huge visual impression. Your porch should blend with your existing home’s architecture; yet, stand out as a backyard centerpiece. As a prominent St. Louis contractor, Archadeck of West County and St. Charles County has both the experience and expertise to walk you through the ‘design and build process’, every step of the way. In the end, your screened porch addition will complement your existing home, your family’s lifestyle, your personal tastes and your budget. Visit our website and photo galleries, west-county.archadeck.com, to see our porch projects throughout Greater St. Louis and St. Charles in Missouri. Or call us, 636-227-0800, to schedule an onsite appointment. Outside of Greater St. Louis, visit archadeck.com for other locations. 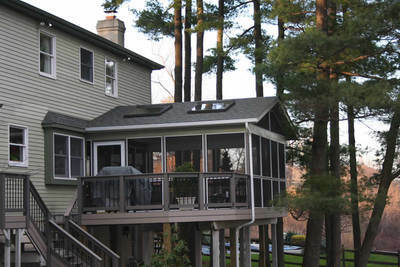 Enjoy the slideshow of screened porches by Archadeck.